Wow. This car is a stunner! 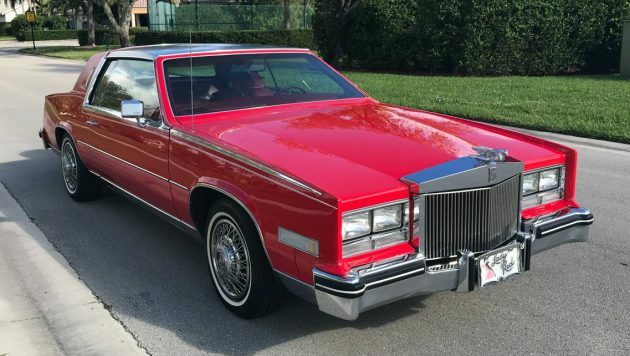 With that bright red paint, bold grill and miles of chrome this car stands out, just as a Biarritz should! 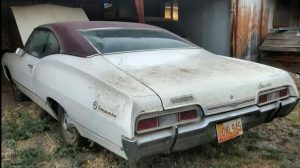 With just 53,000 miles and owned by an elderly person, this car looks to be in excellent condition. Can’t you just imagine driving it around the neighborhoods in south Florida? If you can, you can find it here on craigslist in Miami for $13900. That red would be blinding on a bright summer day in Florida. I might be tempted to only take it out after sunset if it were my car. 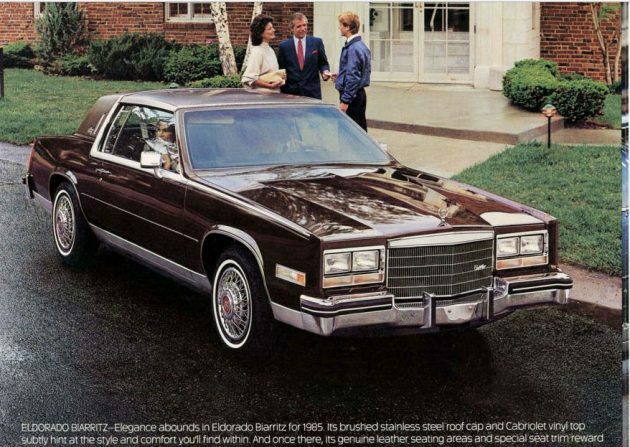 This Eldorado Biarritz is 32 years old but it sure doesn’t look like it! 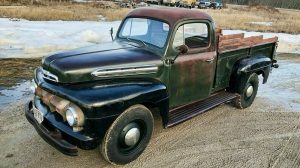 With the wire wheel covers and white wall tires it looks like it is almost new. The seller only tells us that it has an 8 cylinder engine which could mean the troublesome 4.1 liter or the 368. Is there any way to tell without a picture? The interior is gorgeous! I don’t see any wear other than a slightly discolored steering wheel. The seats look fabulous, and unfortunately we aren’t likely to have red interiors again anytime. This car has the digital dash which appears to be working and the air conditioning is cold. I love the woodgrain and maroon interior since it reminds me of the cars I had when I was a teenager! 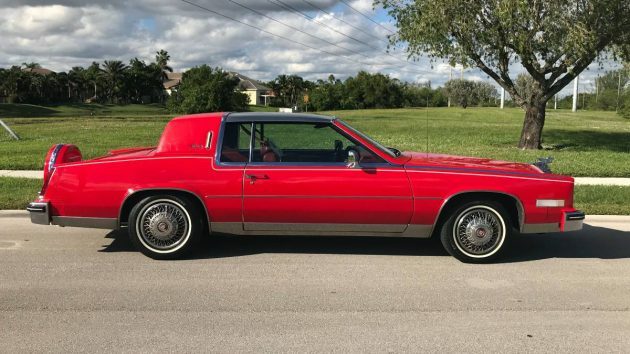 The Biarritz weighs about 200 lbs more than the standard Eldorado and certainly a large portion of that weight is due to the larger grill in front and the spare tire and carrier at the rear. In fact, that spare is the only part of the car that I’m not in love with. I can even appreciate the bright red paint. What would you do with this luxury machine from 1985? I grew up with this generation of Eldorado and love the lines! Hate the spare tire carrier and can live without the grill. The exterior red seems mismatched with the interior maroon. I would pass on this low mileage car. Yes, those two reds are hideous with each other. 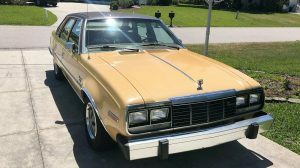 Fort Myers FL craigslist has a 1985 Biarritz for $2000. Its been stored a long time. It looks solid. 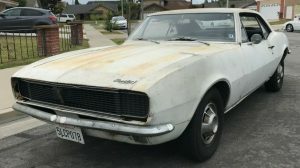 Asking price is $2000; but it has been listed for a couple of weeks. There is also a 1989 which a different car in so many ways. Elderly in Florida …. really? These are great great cars from that era. Love the stainless top! 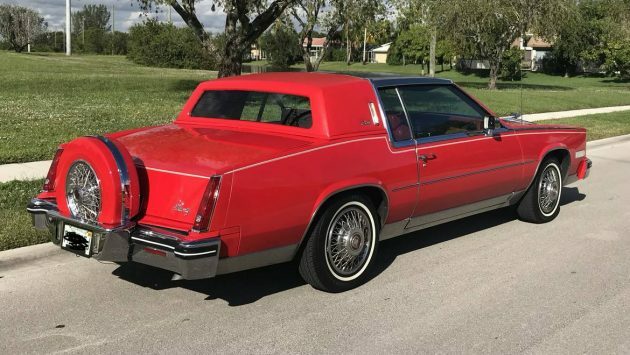 4.1L V8 with direct fuel injection was standard on all 1985 Cadillacs according to the brochure I found online. A 5.7L Diesel was a no-charge option, also according to the brochure. Lastly, the grill is aftermarket and ugly just like the spare tire on the backend. Remove both for a start. The 4100 V8 engine was and still is a disaster. It consumed oil due to its intake. We had to rebuild every engine we sold. And yet I have several that are perfect. Jaymes speaks the truth. From the onset, the 4.1L started with what GM deemed as bad Babbitt material on the crank main bearings. Knocks and 5 increased bearing thicknesses later and, after a number of crankshafts wiping out, they finally figured having a block upper crank journal made of aluminum and a lower crank bearing cap made of iron, wasn’t such a smart idea. Dissimilar metals with dissimilar heat ranges. Once the oil pressure dropped, the cams and lifters would wipe out, provided the head and intake gaskets didn’t cause it because they would leak coolant into the oil due to the same reason of dissimilar metals expanding and contracting, ripping the gasket materials. GM provided the consumer with a fix, though. Pellets, made from what appeared to ground wood, that were supposed to be added to the coolant. Hey, whoever gets this car, contact me. I have 3 complete camshaft/lifter kits and all the bearings you’ll ever need because, I worked for a Cadillac/Oldsmobile agency as a technician during those Fab ’80’s. It has the HT4100 or the diesel. It does not have direct injection. It doesn’t even have multi port injection. There is no reason for it to weigh much more than the non garish base coupe. Plus I’d rather have this unadulterated version, even with the sunroof leak, for $9K. Supposedly only has 22,000 miles! I don’t see where the listing states that the sunroof leaks? Daved N., if you expand on pic number 10, the headliner shows the leak. The post did not state anything about the leak. It was hard for me to find it, but I got to the pic with the inside of the sunroof, and expanded the pic for a better look. What am I missing here…pic #10 is an exterior shot, and I don’t see a sunroof at all on this car??? I can ONLY imagine it driving around the neighborhoods of South Florida! Yes that grill and continental kit in back are both after market. The easiest way to recognize a Biarritz was the stainless steel cap on the roof with the half vinyl top. Looks like something from Pimp My Ride. Anybody know if this is an original color for ’85 Eldorados? I can’t find proof one way or the other. Most red examples I can find are more of a garnet color, which would certainly match better with the interior. Perhaps it’s a special order or a well-executed color change. Kind of thinking the same thing. It’s more Maaco then factory. The exterior and interior clash way too much for that to be a factory color. Normally; I find these grotesqueries to be, at best, in bad taste. However; in this specific case, there is a distinct charm. It is an attractive and presentable older car. I feel odd even writing it. Makes me want to unbutton my shirt halfway and put on a white belt. Is this the “PIMP Package”? Again, how to tell it’s not the 368 is by the year. Great without the grill and the tire. 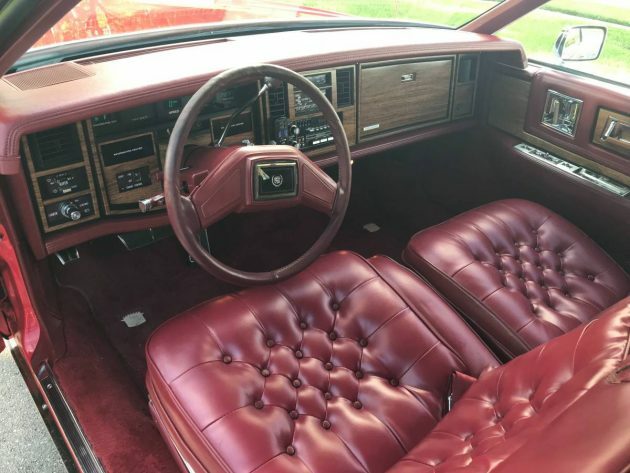 I have an ’85 Biarritz with almost double that mileage and my red steering wheel looks fine, I suspect this is an aftermarket leather wrap? My seats are also way shinier…maybe from my duff buffing?? ?